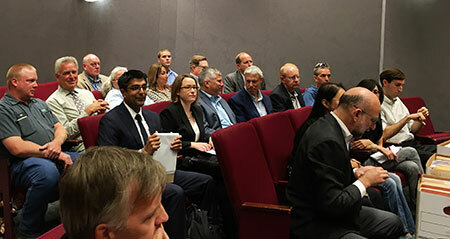 RISE co-plaintiffs in Complete Lawn Care, Inc. et al v. Montgomery County, Md., fill the court room to hear Judge Terrence McGann read his ruling from the bench, declaring Bill 52-14’s private property ban to be unlawful and preempted by Maryland law. The Montgomery County, Md., Circuit Court struck down the county’s ban on lawn and garden pesticide use on private property, deeming it unlawful and preempted by Maryland law. Responsible Industry for a Sound Environment (RISE) said it is pleased with the court’s decision. In November 2016, RISE, along with seven residents, six local businesses and CropLife America, filed a legal challenge to Montgomery County’s ban on the application of hundreds of lawn and garden products on private property. A grassroots coalition of more than 400 residents, homeowners and licensed professionals worked together to oppose the ban since it was introduced in 2014. The ban narrowly passed the County Council with County Executive Ike Leggett expressing doubt about its legality before allowing it to go into effect without his signature. This grassroots coalition succeeded in laying the groundwork for a successful legal challenge to a contentious and complex ordinance that left Montgomery County residents uncertain about how to protect their lawns from weeds and pests.